Most hotels in south Tucson are located along the I-10 corridor or beside the airport. The interstate approaches from the southeast, through lightly developed surroundings, close to the huge Davis-Monthan Air Force Base to the north, and passes varied neighborhoods of residential estates, business parks and patches of desert, the main commercial district being around the Palo Verde Road exit. Tucson International Airport lies right at the south edge of the city, 7 miles from downtown, equidistant between I-10 and I-19; a large group of hotels, and a few shops, are found to just the north, along Tucson Blvd. 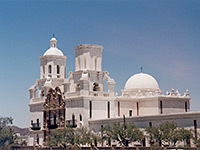 Six miles west of the airport, Mission San Xavier de Bac is a beautiful white stone church, on the site of a Spanish mission founded in 1692. The two sections of Saguaro National Park are both about 15 miles away from the airport, to the east and west. DoubleTree Suites is the closest hotel to Tucson International Airport, located on the corner of Corona Road and Tucson Boulevard, a quarter of a mile from the front of the terminal buildings. Highlight is the sheltered courtyard harden, featuring an outdoor pool, seating areas, walkways, flower beds, fountains, tropical plants and shady trees; all overlooked by the accommodation blocks, containing spacious, modern two-room suites, all equipped with a refrigerator & microwave. The on-site restaurant/lounge is the bistro-style Finnegan's, open all day (plus room service), while for meetings the hotel has over 12,000 sq ft of space, together with a staffed business center. The DoubleTree Suites opened spring 2012, after renovation of an existing property. Towards the upper end of the market for Tucson Airport hotels, the Courtyard by Marriott offers superior facilities and 149 spacious rooms, in 2 blocks overlooking the courtyard garden, at the center of which is the heated pool and hot tub, all surrounded by tall palm trees. Many of the rooms have private balconies, overlooking the gardens or the surrounding neighborhood, a mostly commercial district half a mile north of the airport buildings. The hotel's Bistro restaurant/lounge is open for breakfast and dinner; for other dining choices there are a few fast food restaurants just north along Valencia Road. One of three Marriott hotels close to Tucson International Airport, the Residence Inn along Medina Road accommodates guests in 124 roomy suites, all with separate sections for sleeping, working, relaxing and cooking - the latter in a full kitchen complete with dishwasher, oven, microwave and refrigerator. Although available for single nights, the hotel is aimed more at extended stay travelers, within easy reach of all sites in Tucson via I-10 or I-19, both 3 miles away. The inn operates a complimentary shuttle to/from the airport, and has many amenities including free buffet breakfast, free evening reception, guest laundry, pool, whirlpool, bbq grill, fitness center and meeting space for up to 80 people. The second Staybridge Suites hotel in Arizona opened in 2010 a few blocks from Tucson International Airport, offering high quality all-suite/extended stay accommodation; the 97 suites all have a full kitchen, DVD player and executive desk, while other amenities are an outdoor pool (in the middle of a sheltered courtyard garden, complete with waterfalls and fire bowls), lounge with fireplace, fitness center, sports court, convenience store, bbq pavilion and 24 hour business center. Both hot breakfast buffet and evening reception (Tue-Thu) are provided free of charge. Pets are welcome, for a fee. Small meetings can be accommodated in the hotel's 12-person boardroom. Like most hotels serving Tucson International Airport, the Hilton Garden Inn is located a short distance north of the terminals, albeit slightly further away (1.5 miles) than the others. There are plenty of restaurants close by, in an otherwise business neighborhood; the city center is 7 miles north. The hotel has an extra large outdoor pool at the front, complete with hot tub and lazy river. The Garden Grille & Bar offers all day dining (no lunch at weekends, however), either inside or on the patio. As well as the airport, the complimentary shuttle serves places within a 5 mile radius, such as the Pima Air & Space Museum and Irving Plaza Shopping Center. Meetings of up to 250 people can be accommodated. Hampton Inn Tucson Airport is a walkable 0.4 miles from the entrance to the terminal building though the hotel does of course provide a complimentary shuttle service. Good quality free hot breakfast is served each morning (take-out version available), while for other meals, apart from the airport, the nearest restaurants are along Valencia Road, about one mile north. The 129 room hotel has a pleasant garden and outdoor pool on the sunny south side, lined by mature trees; inside, the main facilities are fitness & business centers, a 24 hour convenience store and coin-operated laundry. Open fall 2009, the new TownePlace Suites Tucson Airport is part of a group of hotels one mile north of the terminal buildings, and 3 miles from both I-10 and I-19. The pet friendly hotel features 91 comfortable studio suites, equipped with a full kitchen, sofabed, LCD TV, work desk, free internet access and luxury bedding. Guests are treated to free full hot breakfast each morning, and a free reception on selected weekday evenings; there are plenty of restaurants nearby to provide other meals. An outdoor pool (complete with fountains), sports court, patio and fitness center are available for relaxation. The Hyatt Place is one of the closest hotels to Tucson International Airport, just half a mile north of the terminals, linked by free shuttle which also serves other nearby locations. Shady trees shield the hotel from its busy surroundings, and provide seclusion for the outdoor pool. The brightly decorated guest rooms feature a sofa bed, a refrigerator, free wi-fi and a separate living area. Complimentary breakfast buffet is prepared each morning, while drinks, snacks and light meals can be purchased from a 24 hour market. The hotel also has a bar, serving coffees during the day, cocktails and other drinks in the evening. Clean, large rooms, nice free breakfast and welcoming staff are the main attributes of Holiday Inn Express Tucson-Airport, located less than a mile from the terminal buildings (served by 24 hour complimentary shuttle), along Medina Road. The airport is at the southern edge of greater Tucson, and the hotel lies close to the start of undeveloped desert just to the southeast, near attractions such as Pima Air Museum (5 miles) and the San Xavier Mission (6 miles). The hotel has attractive Southwestern decor in the rooms, and amenities of an outdoor heated pool, spa, fitness center, guest laundry and business center. With 167 rooms & suites, the Best Western Plus is one of the largest Tucson Airport hotels, and offers full service amenities. For dining, Morgan's Restaurant is open for full breakfast (complimentary), lunch & dinner, and the adjacent lounge bar serves drinks all day, including poolside service. The rooms are arranged around three sides of a large tropical garden; as well as the swimming pool this contains a hot tub, sundeck, shaded walkways, many palm trees and other tropical plants. Meeting facilities comprise over 8,000 sq ft of event space, accommodating up to 200 attendees. Other facilities include a 24 hour convenience store. The Best Western is part of a line of hotels along Tucson Boulevard, half a mile from the airport. Towards the east edge of Tucson, the Comfort Inn provides good, mid range accommodation in a relatively new, three floor building containing 48 rooms & 17 suites, located in the middle of the Butterfield Business Center. I-10 runs by to the south (access is from exit 264, Palo Verde Road), and the Davis Monthan AFB begins a short distance northeast. The hotel features free hot breakfast, an outdoor pool, hot tub and guest laundry services. The international airport is 4 miles south (no free shuttle, however). The Comfort Suites at Tucson Airport has 82 medium sized suites, with separate living/sleeping/bathroom areas, equipped with a microwave, refrigerator, ironing facilities and coffee maker. Just half a mile from the airport, the inn lies in the middle of a group of other hotels along Tucson Boulevard, though is set back slightly from the main road for a quieter night's stay. Free hot breakfast buffet is served; for relaxation the expected fitness center, hot tub and outdoor heated pool are provided. Formerly Palo Verde Inn, the new Quality Inn Tucson Airport has an easily-reached location just south of I-10 exit 264 (Palo Verde Road), next to a few restaurants and 3.8 miles north of the terminal buildings. Nearby sites include Pima Air & Space Museum, University of Arizona Medical Center (South Campus) and Southgate Shopping Center. The 170 room hotel has an older design, with exterior corridors, but all accommodations are recently renovated, and a good range of facilities are available; free airport shuttle, business center, fitness center, outdoor pool/whirlpool and free hot breakfast. Comfortable lodging towards the cheaper end of the market is on offer at the Quality Inn Airport, located along Valencia Road, 1.4 miles from the main terminal at Tucson International Airport. The 97 rooms are on 3 floors of an older, interior corridor building, some with views over the outdoor heated pool and hot tub. Airport transportation is free, as is the continental breakfast. The main road has a fair selection of restaurants, though the immediate neighborhood is generally industrial, without much of interest to see. Studio 6 Tucson features affordable, all suite accommodation with limited amenities - wi-fi, an outdoor pool, guest laundry and free coffee are the main facilities, but each room does include a small kitchen with utensils. The hotel backs on to I-10 at the Palo Verde/Irvington exit, 4 miles north of Tucson International Airport, in a busy commercial neighborhood. There are a few restaurants nearby, and the closest shopping mall (Irvington Plaza) is one mile west. The Baymont Inn & Suites sits in the middle of the group of lodging along Tucson Boulevard, just 0.4 miles from the airport lounges, and served by free 24 hour shuttle. The inn occupies a compact, 85 room building with typical amenities of complimentary breakfast (including a few hot items), a business center, exercise room, heated outdoor pool & hot tub, meeting room, guest laundry and a convenience store. Rooms are clean and modern, equipped with microwave & refrigerator; a few suites are available with extra living space and a sofa bed. The hotel is positioned 350 feet back from the main road and so provides quiet accommodations. The Days Inn is relatively far (4.3 miles) from Tucson International Airport, situated beside Interstate 10 (Palo Verde Road exit) in lightly developed surroundings towards the southeast edge of the city. Adjacent properties are a gas station, one restaurant and two hotels, while other sites in the vicinity include University of Arizona Medical Center, Tanque Verde Swap Meet and Davis Monthan Air Force Base. North-facing rooms are the quietest, away from the interstate; they look out across a patch of open desert land. All accommodations contain a microwave and refrigerator. The main hotel features are an outdoor pool, a business center and free continental breakfast. Although still a budget-priced property with limited facilities, Motel 6 Tucson Airport has a stylish, adobe style frontage and occupies a spacious, landscaped site centered on a large courtyard garden with outdoor pool and sundeck. The parking area all around the perimeter is shared with one restaurant, and there are several more close by. The motel adjoins Interstate 10 at the Benson Highway intersection, 4.5 miles north of the international airport. Wi-fi and morning coffee are complimentary.